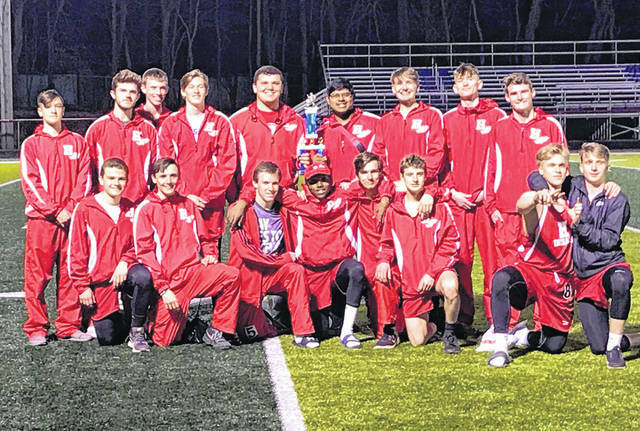 The Hillsboro High School boys track and field team is pictured at Zane Trace High School with their first place trophy from the Zane Trace Invitational on Thursday, March 28. The Lady Indians finished third in the girls competition. The Hillsboro Indians boys and girls and Farifield Lions boys and girls Track and Field teams traveled to Zane Trace High School on Thursday, March 28, and took part in the Zane Trace Invitational. The Hillsboro boys team took first place in the team standing and the Farifield boys team was third in the team standings while the Lady Indians took third place and the Lady Lions finished in eighth. The boys 4×800-meter relay team from Fairfield took home first place and finished with a time of 8:47.54; the team consisted of Bennett Hodson, Ethan Davis, Gavin Campbell and Brandtson Duffie. The Lady Indians 4×200-meter realy team of Bre Karnes, Sydney Callahan, Eden Edenfield and Jaeleight Hart finished in first place with a time of 1:54.63. The Hillsboro Indians boys 4×200-meter relay team of Taylor Lucas, Anthony Richards, Kai Rickman and Ty Alexander was second with a time of 1:37.99. Bennett Hodson of Fairfield took second place in the boys 1600-meter run and finished with a time of 4:57.70. Sydney Callahan of Hillsboro took second place in the girls 400-meter dash and finished with a time of 1:08.62. In the boys 400-meter dash it was another Hillsboro representative, this time with a first place finish, as Ty Alexander crossed the finish line with a time of 53.33. Cierra Lively and Quinn Conlon finished second and third in the girls and boys 300-meter hurdles events as Lively finished with a time of 53.82 in the girls event and Conlon made his mark with a time of 45.43. Duffie and Hodson finished first and second in the boys 800-meter run with respective times of 2:04.41 and 2:12. Hillsboro’s Edenfield took second place in the girls 200-meter dash and finished with a time of 28.02 seconds and Alexander took second in the boys 400-meter dash with a time of 24.27 seconds. Cohen Frost and Davis finished first and second in the boys 3200-meter run as Frost earned first place with a time of 10:42.79 and Davis was second with a time of 10:44.96. The girls 4×400-meter relay team from Hillsboro of Edenfield, McCreary, Callahan and Hart finished in second place with a time of 4:38.73. The boys 4×400-meter relay team from Fairfield took first place in the boys event with a time of 3:42.59 and consisted of Hodson, Gavin Campbell, Wyatt Fent and Duffie. Draven Stodgel of Hillsboro was first in the boys discus throw and shot put with distances of 160-07 and 50-07 respectively. Deon Burns of Hillsboro was second in the boys shot put and finished with a distance of 49-00.5. Hillsboro’s Anthony Richards was second in the boys long jump event and cleared a distance of 19-02.75 and Callahan was second in the girls long jump with a distance of 14-06.75. Fairfield’s Ethan Sounders was third in the boys pole vault event and cleared a height of 10-06. The McClain Boys finished third out of eight teams at the Circleville Kiwanis relays on Saturday, March 30. First place finishes were 4×800-meter realy team of Chris Starkey, Nathan Ernst, Paul Bliss, and Reece Schluep. The boys 4×100-meter relay team of Kobe Penwell, Pat Fout, Matt Bliss, and Trevor Newkirk also placed first. We also had a second place finish in the 4×400-meter relay and the team consisted of Fout, Bliss, Schluep and Newkirk. Girls team finished seventh out of eight team. There was a five point difference between places 5-7. First place finishers for the girls team were the shuttle hurdles team of Iva Easter, Lexi Jones, Kerigan Pollard, and Zoe Rios. Maddy Crawford and Emma Stegbauer finished second in Long jump for the combined score.